The venture selected the site due to access to the Norfolk Southern Railroad and State Highway 17, as well as access to a Nicor natural gas main line and Com Ed electric power. With Heritage already affiliated with GROWMARK, the Bloomington, IL-based company assigned its construction division (309-557-6334) to design and build the terminal. Engineers designed a 2.4-million-bushel steel elevator for maximum flexibility to handle corn and soybeans simulataneously and to load both covered hopper railcars on an 8,000-foot loop track and containers for shipment to a Burlington Northern Santa Fe container yard 25 miles away in Joliet, IL. Cost of the facility is confidential. • TCR Systems LLC, Decatur, IL (217-877-5622), served as millwright. • VAA, LLC, Plymouth, MN (888-583-3527), performed structural engineering services. • Cross Country Construction, Elbow Lake, MN (218-685-6410), erected the steel grain storage tanks. • KDJ Sales & Service Inc., Mackinaw, IL (309-359-3611), served as electrical contractor and installed automation systems. • Hamann Wagner Excavating Inc., Chebanse, IL (815-790-8248), did excavation work. • Greg Lambert Construction, Bourbonnais, IL (815-468-7361), along with Eastern Grain employees, built the container loading equipment. • A 90-foot-diameter tank holding 515,000 bushels of soybeans standing 88 feet tall at the eaves and 113 feet at the peak. Similarly equipped to the 105s, this tank includes a 16-cable temperature monitoring system, four 30-hp centrifugal fans, and 10 roof exhausters. • A 72-foot-diameter wet tank holding 315,000 bushels of corn. It stands 85-1/2 feet tall at the eave and 105-1/2 feet tall at the peak and is equipped with a 12-cable temperature monitoring system, two 40-hp aeration fans, and seven roof exhausters. In addition, the facility has a 30,000-bushel hopper tank for off-grade grain and a 12,000-bushel screenings tank. Inbound grain trucks utilize a 70-foot Fairbanks pit-type scale adjacent to the facility’s 1-1/2-story office building, which is under the control of a CompuWeigh SmartTruck system. A SmartTruck card reader scans the driver’s RF tag, and the system provides data on the truck and contents to interface with the cooperative’s accounting system. A Gamet Apollo probe takes a sample for grading. A separate Fairbanks outbound scale also is part of the SmartTruck system. Trucks proceed as directed by SmartRead screens to one of two 1,000-bushel mechanical receiving pits. These pits can feed any of three GSI legs – two 20,000-bph receiving legs equipped with Maxi-Lift 20×8 CC-MAX buckets on a 22-inch Goodyear belt and on a 30,000-bph shipping leg with two rows of 16×8 CC-MAX buckets on a 34-inch belt. Wet grain can be sent via wet leg to one of two natural gas-fired Zimmerman The storage tanks empty onto above ground GSI conveyors – 57,000-bph belts from the 105s, a 30,000-bph belt from the 90, and a 20,000-bph drag from the 72 – all running back to the central legs. 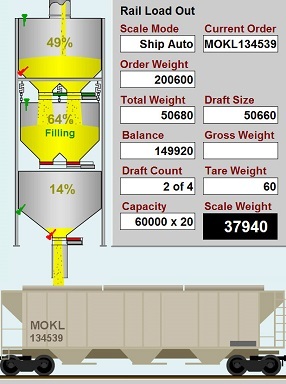 An overhead 57,000-bph GSI enclosed belt conveyor carries grain overhead to a 50,000-bph CompuWeigh bulk weigh loadout scale under the control of the supplier’s GMS-4000 automation system.